We are a leading Authorized Retail Dealer of Suzuki Access 125 Scooter and Suzuki New Access 125 SE Scooter from Kadapa, India. The New Suzuki Access 125 is our flagship scooter which combines the best of both worlds - power & mileage - with our revolutionary SEP technology. A complete redesign from the ground up - both aesthetic and technical - emphasizes that this scooter welcomes any road. The New Access 125 boasts a state of the art SEP engine, new frame, optional disc brake and various updates to wheels, suspension, transmission and body panels; giving it improved fuel efficiency, performance, cornering stability, smoother ride and added protection. Design wise, the new Access has evolved into a royal and sophisticated look with chrome finish, 3D emblem logo and rich bodywork with stylish edgy contours. The new Access 125 will also be available with an optional front disc brake and alloy wheels. In addition, are class leading features like the first of its kind Suzuki Easy Start System, multi-function instrument cluster with digital display, front pocket and optional DC socket. These features have been incorporated keeping in mind practical usage in real world conditions and the comfort of Indian riders. The New Access 125 is an amalgamation of Great Style and Powerful Performance bundled with class leading features, meant for everyone who loves to ride. The enjoyment in the ride makes the New Access 125 completely UNLEAVEABLE! The New Access 125 will adorn showrooms in 6 sophisticated colours - Pearl Suzuki Deep Blue No.2, Candy Sonoma Red, Pearl Mirage White, Metallic Matt Fibroin Gray, Metallic Sonic Silver (YD8) and Glass Sparkle Black. 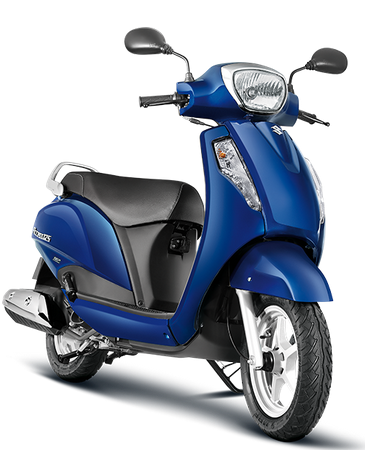 Here comes the new stylish matte colour variant of the Access 125. The fresh, new colour provides a fashionable makeover to the flagship Suzuki scooter to appeal to the young trend conscious riders. The special edition of Access 125 will now be available in elegant Metallic Fibroin Grey (PGZ) and Metallic Matt Black colours (YKV) & Pearl Mirage White (YPA), giving the scooter a distinctive sporty appearance.